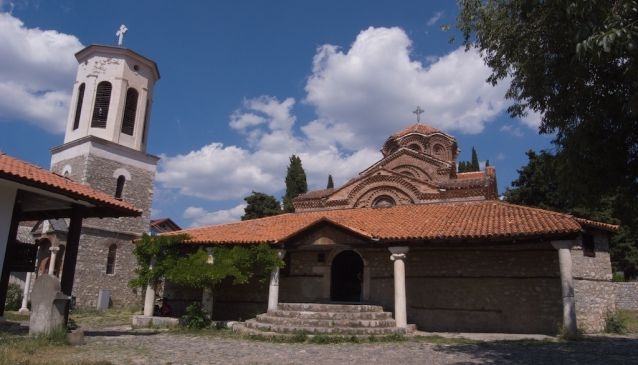 In 1295, near the Upper Gate in the Old Town in Ohrid, the most beautiful church in Ohrid was built. It bears the name of Mother of God Perivleptos. Also, it is known as the Church of St. Clement because when St. Clements's church was destroyed by the Ottomans, the relics of St. Clement were moved to this church. When entering the church it is inevitably to notice the beautiful paintings which present scenes from the life of Christ and the mother of God. The fresco paintings will impress you because the painters used vivid colours and splendid techniques in order to create masterpieces. Many valuable items can be seen in the church including: old music notes of Byzantine church songs, old ecclesiastical books, manuscripts of 11th and 12th century as well as old Litian icons. Another reason more why to visit the Church of Mother of God Perivleptos is the fact that within the church the popular Gallery of the Ohrid's icons is situated. Many unique works which originate from the Byzantine period can be found here.